When I was farming, we would weed the strawberries regularly, and take all the brown parts off of them in client’s yards so they would be pretty, or pot them up to sell. And I slowly noticed that the little yellow center of their happy white flowers would get bigger and make a dome. And sometimes I’d see pre-ripe, young, small strawberries that hadn’t turned red yet. But it took me a while before I saw the same little yellowish strawberry emerging out of the center of a flower. Holy crap! “Does each flower become a strawberry? !” “Yes, Ruthy,” my kind boss would say. My lack of knowledge never seemed to bother him, I think because my excitement when I did learn made up for it. And because he likes teaching. It was a good match. Then I started noticing that lime flowers birth limes. That apple flowers birth apples. That the seed in the center of the flowers on the strawberry flowers become the seeds we see on the outside of the fruit. I’m still completely amazed by all of this!!! And remember, “fruit” is anything with a seed in it. Not just what goes in a fruit salad. So tomatoes, zucchini, peppers, cucumbers are all fruit and come from the center of a flower. Doesn’t that sound like we get fruit from one of those mermaids that lives in a giant shell under the sea? Like she lives in the center of a flower and took magician classes and gracefully hands us fruit out of thin air? Or is that just me? Moral of the story: Whenever you see flowers on a plant, the more you see, the more you can get excited! It’s like a Christmas tree of color that looks really pretty until it tastes really pretty! Seriously, who thought of this?! Good job! Click for a slideshow to really see the detail in the pics and to read more about them. If you feel like it. No pressure. Doo-do-do-doo! A Zucchini is coming! I love that it’s hard to tell the flowers from the fruit at first glance. These zucchini are similar in shape and color to their trumpeting predecessors. This pomegranate tree’s flowers are red like the fruit will be. I like that the fruit looks like stars and Christmas ornaments. And that the leaves match the shape of the stars. Very different from the winding Dr. Suess elongated zucchini. But still very Dr. Suess. The baby fruit even look like flowers. The flowers look like paper to me and the fruit has such a sturdy armor. Here you can see a few stages of flower, fruit bud, and a half-half mix. It looks like they decided to hang pretty curtains from their shower head. Flowers bring fruit… and beees! See him? All the little red spots are going to be fruit one day! I was getting to swim in this gorgeous place, which is right next to the garden. Thank you Simon & Elaine! Look at their adorable apple tree! Simon & Elaine are Good Apples. Keep looking back and under, there are so many in this bunch! These started out as white flowers. This one decided to grow upwards and sideways and lodge between two branches. I feel that is the equivalent of joining the circus and becoming an acrobat in Appleland. I couldn’t stop taking pictures of these beautiful babies! This is a banana pepper flower looking at it’s future. I love these strawberries! You can really see how the yellow center pops out and starts to become like the little green strawberries on the right. 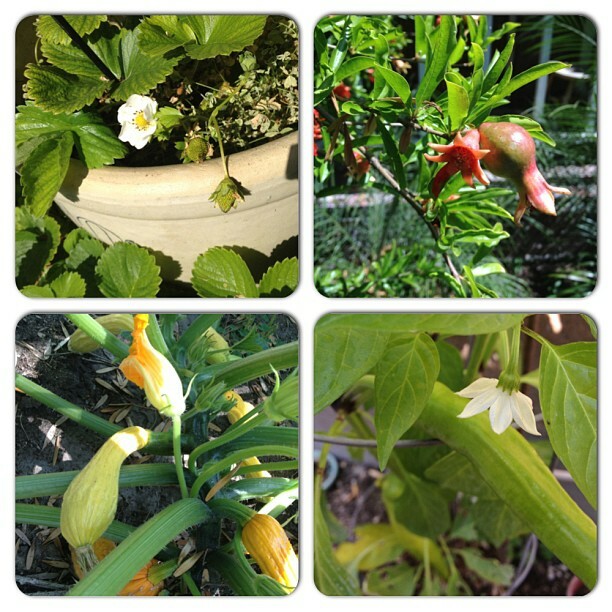 Why do you think so many fruit bearing plants have white flowers? No flower in this one. I just love the cool shade and this sultry strawberry lounging in a bed of green. These tomatoes were flowers too! Wow! Simone! I knew y’all had more fruit trees, but I didn’t know what kind. And I didn’t know about the horseradish! I don’t know anything about horseradish. Other than how it tastes. (I think I had it for the first time at your Seder!) I don’t even know what the plant looks like. Thank you for offering some. That will be exciting to see! Cool article, Ruth. Did you know we also have plumbs coming in now? There’s orange trees too, but no oranges this season :(. We also have horseradish that my grandfather and I planted in the early 80’s, that I transplanted to California. It’s coming with us when we move! Did you also know, I couldn’t tell my comment posted. And I posted it again? I bet you know that.